The company NEPI-Rockcastle presented the details of the future Promenada shopping center in Novi Sad on July 13. 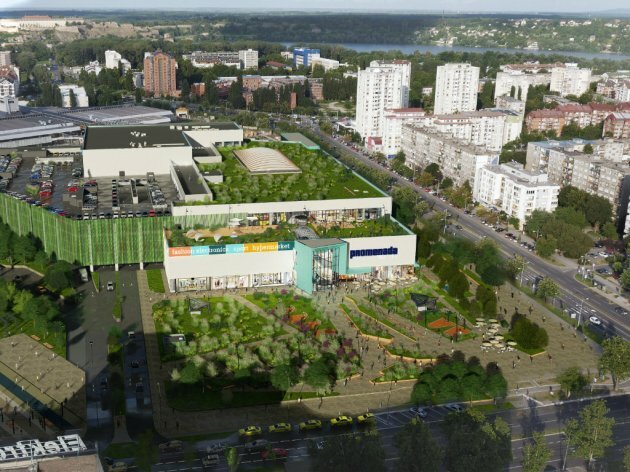 The shopping center on the corner of the Oslobodjenja Blvd and the Cara Lazara Blvd, with 150,000 m2 of area, will redefine the retail scene of Novi Sad and Vojvodina, the investors say. NEPI, which bought a plot of land at Spens in Novi Sad for around EUR 30 million last year, joined forces with Rockcastle, also a real estate company, two days ago, thereby strengthening its market position. The newly formed NEPI-Raockcastle company will invest around EUR 100 million, it was specified, and a total of 1,500 people will find jobs at Promenada. – We are not building property to sell it, but to run it. We plan to open Promenada by 2018. This is one of our biggest investments and we expect it to be very successful – Alexandru Morar, CEO of NEPI-Rockcastle, says for eKapija. Promenada Novi Sad will have four floors of retail space, featuring natural lighting and 1,500 parking spaces on eight floors of the garage. The conceptual design of the shopping center is the work of the Djordje Bajilo Arhitekti design studio and is based on the solution authored by HBRO Romania and HB Design &Handels GMBH Austria. As the investors say, the design adheres to green building and energy efficiency standards. Jelena Jevremovic, Asset Manager for Serbia, says that Promenada will increase the area of shopping centers raised in Serbia by 25%. Once the Novi Sad shopping mall opens, the budget of Serbia will receive about EUR 20 million from it annually through various taxes and contributions. As Jevremovic says for eKapija, there will be 150 stores in Promenada. She announces that many brands will premiere in the Serbian market at this shopping center, and the agreements with these renters should be signed in September. – We are focusing on regions outside Belgrade. We have bought land in Krusevac as well, where we plan to start raising a retail park in early 2018 at the latest – Jevremovic says. NEPI-Rockcastle already owns the Plaza shopping center in Kragujevac. Mayor of Novi Sad Milos Vucevic said that the investment was one of the biggest foreign investments in the city. He said that the construction site was a proof of the development of Novi Sad and promised that the City would help NEPI to overcome all obstacles related to paperwork and administrative procedures which might arise during the construction and he also announced that Novi Sad would develop the area around the shopping centers. As he said, the area around the shopping center will be one of the most beautiful parts of Novi Sad. At the official ceremony, he and representatives of NEPI-Rockcastle laid down a time capsule in the foundations of the future facility.